What drives you as a drummer? "The pursuit of my own sort of perfection, I guess; always wanting to play better, to make a song sound better, and to be better at all of the things that that entails - be it feel, time or consistency. Those are the skills that make a drummer good, or great, and that's what drives me because I don't feel like I am anywhere near where I would like to be… And I don't know if I ever will be, I think it will forever be a work in progress. I look at other drummers and wonder how they got to that place, you know? But as you get older, the other thing you realise is that you are who you are as a musician; your heart beats a certain way and you feel music a certain way, so there are always things that you are never going to be able to change. But you work on and improve the things that you can, and there is always someone out there to learn from. 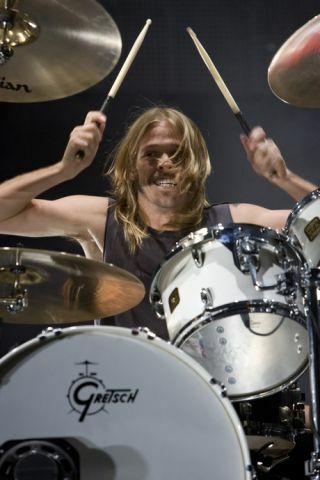 The one thing I do know is that I'm the best Taylor Hawkins drummer there is, and that is all I can hope to be. And when it comes to music, musicianship and skill, there is no such thing as better or worse because so much is personal opinion, and I can see that now. When I was a kid, of course I wanted to be the fastest, the loudest and the one with the biggest drum set, but obviously my aspirations have changed a bit since then. Well, some of them anyway…"
"Your heart beats a certain way and you feel music a certain way"
"In hindsight, if I could go back in time and relay a message to my younger self, I would tell him to work on his time keeping, and that the job of a drummer is not to be the one that gets noticed the most on stage, or to be the fastest, or the loudest. Above all, it is to be the timekeeper. I figured that out later in life and I have had to go back, and in some ways relearn, especially in the studio. "The bummer is that when I was 13, I was unteachable… I just didn't want to know. Drums were the only thing that was mine, just mine, and I learned from my heroes by listening and playing along to my favourite records. There is a certain originality that you get playing by ear - some of the most creative drumming I've heard has come out of that method of learning, and playing from the heart. But I would say to any young drummer, even if you don't want to take lessons, even if you are not interested in that sort of teaching, play along to a metronome for half an hour a day. Don't think about it, don't worry about it, just do it - to help develop your internal clock. Time is relative in drumming and, of course, there are drummers I love who are exciting and speed up... Live it's one thing but, in the studio, it's really important to be able to keep things steady. Nobody is going to have perfect time; some drummers are close and I think Dave (Grohl) is actually; he has one of the steadiest meters in the business, and that's something I really look up to." How do you see the next 25 years of your drumming career panning out? "I've been lucky enough to have fulfilled so many ambitions, and gone way past anything I ever thought I would do. I could never have imagined the career that I've had with the Foo Fighters - playing stadiums and having songs on the radio. It's amazing, and my goal is really just to carry on playing. I want to keep playing until I'm dead. Will I retire from going on tour? Probably, but I'll never retire from playing music." You have featured on a number of Rhythm covers. Which ones have been your favourites and what memories do you have of doing them? "My favourite would have to be the issue where I was Guest Editor and got to interview my classic rock heroes - Phil Collins, Stewart Copeland, Roger Taylor and Stephen Perkins - and to pay tribute to Jim Gordon, who is sadly only remembered for the tragic events in his life, not the fact that he was an incredibly important drummer. Doing that issue was great fun, and I hope the readers enjoyed it as much as I did. I think it was neat because you got a very different magazine looking at just one player's influences… Am I allowed to do it again one day?"